Believe it or not, Sydney can be a confusing place to get around for newcomers. 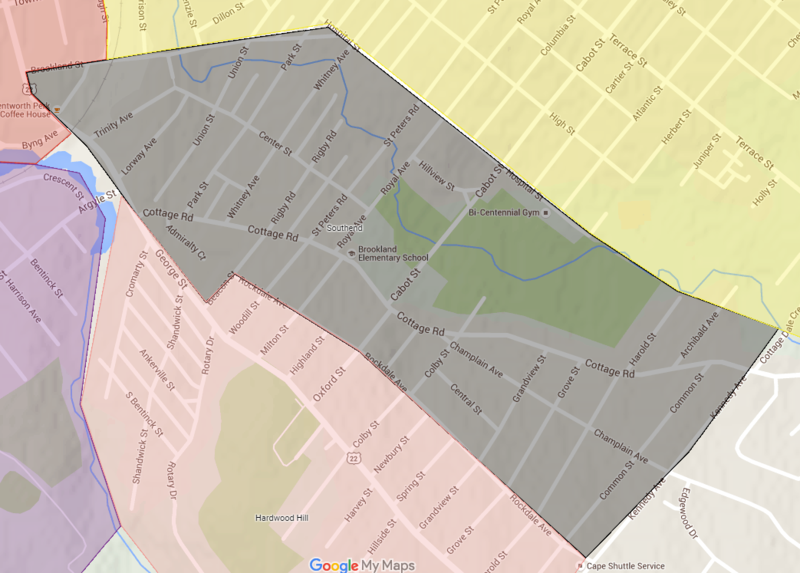 Personally, it took me too long to figure out that the Northend, Northside, and North Sydney were three wildly different places. Many neighbourhood borders were drawn from voting lines and railroad tracks that don't exist anymore, and the only people who know where one community stops and another starts are 90, and even they fight about it. I tried looking online for some sort of map or rough description, but they don't exist, so I decided to make one. Why not? I've lived here for two years and have known an historian or two. I'm totally qualified. Here's a link so you can eyeball it yourself. The first thing you'll notice about Ashby is that it's really big. It is the largest neighbourhood of Sydney proper, but most of the land above Terrace Street was little more than farmland before the 1940's. Ashby sprung up as a working class neighbourhood with the rise of the steel plant, and most of the houses were built for, and in a lot of cases by steel plant workers. The housing co-op had an impromptu beginning here, as steel workers and their buddies would simply buy the lumber and materials they needed to build their own house, and the houses of their buddies. I had no idea I grew up on The Southend! The Southend, compared to Ashby, is a little bit older, a little bit smaller, but the houses are a bit bigger. The Southend was the primary residence of the upper management of the Steel Plant. Into the early 20th century, most of the land past Townsend was farmland, where people would walk their cows. Once the steel plant arrived, the Southend became the site of the largest houses in Sydney. To this day, if you want to see what top of the line early 20th century architecture looks like, take a walk down the Southend Whitney Avenue. A.K.A. Old Sydney. A.K.A. Historic Sydney. The Northend is the oldest neighbourhood Sydney has to offer, being built to house the original denizens of the small government town. Most of the houses in the Northend are over 100 years old, and it's the most likely place to see old-world stone work in the Sydney area. In the past 60 years, the Northend had fallen on hard times, with it's proximity of the tar ponds and falling housing prices. Luckily, with the removal of the tar ponds and the addition of parks and the New Dawn Centre for Social Innovation, Sydney's historic district is seeing a drastic turnaround, but you can still buy a house close to Downtown on the cheap, which is why I bought a house there last week. A.K.A. Downtown. 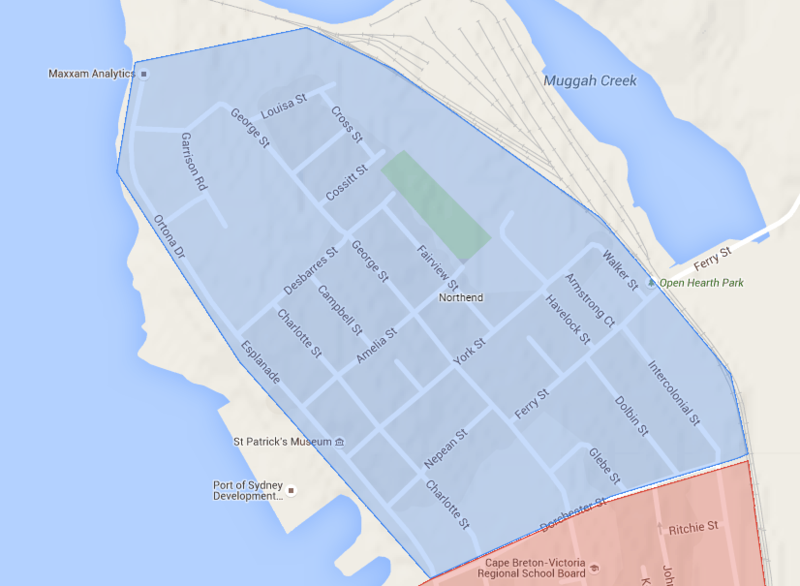 The Sydney Waterfront District isn't technically a neighbourhood, because few people live there. In my mind, it's not really a neighbourhood if grade school kids didn't form a tribe around it in the 1960's. It's a great place to buy coffee and comic books though! The Shipyard is where the colonies used to bring their ships in for repairs and building in the late 18th century. Eight generations later, we're still calling it The Shipyard, even though a ship hasn't been built or repaired there for over 100 years. I guess we're stubborn. 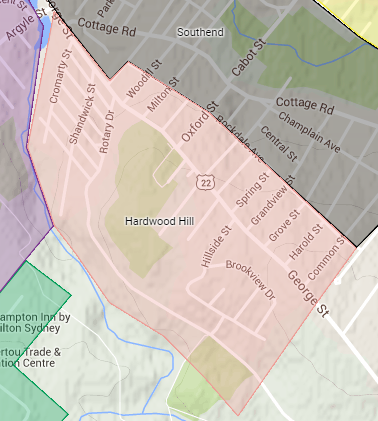 Hardwood Hill is named after the trees made of hardwood, that just so happen to be on a hill. These days Hardwood Hill is better known for it's sizable cemetery which affords some of the best views of Sydney and the heavens above. 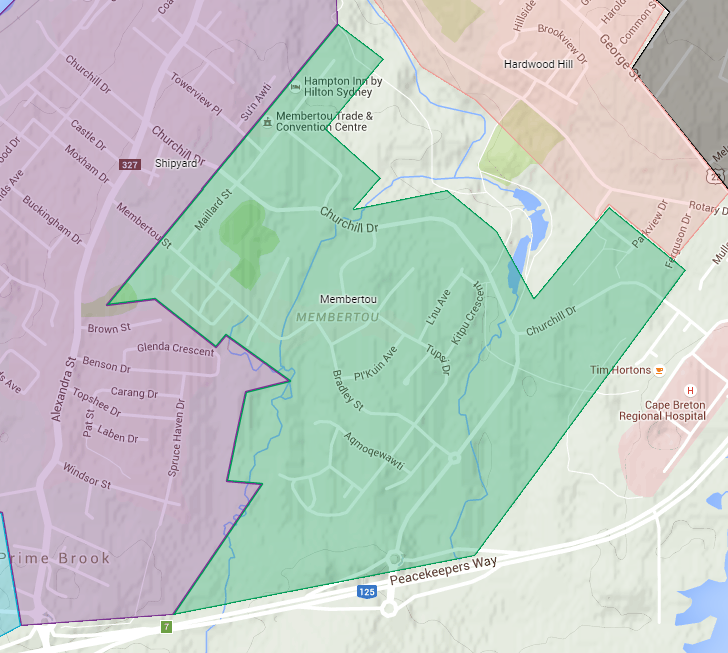 The top of Hardwood Hill has very little light pollution, giving you the best views of the stars within city limits. If you live in Boulderwood, you probably own a nice house. There really isn't much more to say about it. 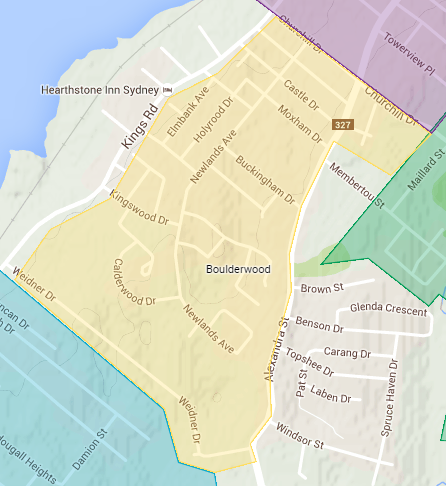 Boulderwood is actually more of a subdivision than a neighbourhood, being built in the 1950's and 60's with the rise of Commercial Sydney River. No kids got in playground fights defending the honour of Boulderwood, and if you live there you need a car. Nice houses and lawns though, so there's that. 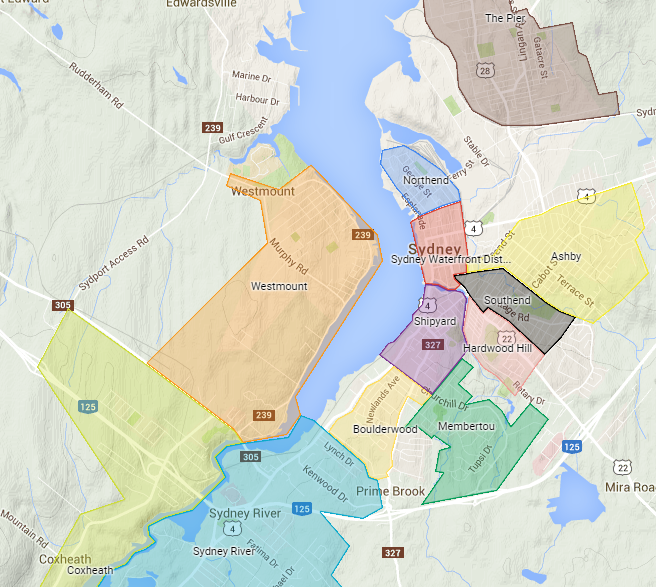 Calling Membertou a neighbourhood would not be accurate, seeing as it belongs to the greater tribal group of the Mi'kmaw Nation. If you're wondering, I didn't eyeball these borders. I got them from Google, because people take this stuff seriously. Membertou has an awesome trade and convention centre that I plan on visiting again this year for Celtic Colours, among a bunch of other stuff. They're doing well. Along with Ashby, Whitney Pier housed most of the steel workers working in the coke ovens of the 20th century. During the 1900's, Whitney Pier saw a boom of immigration, making it one of Canada's most diverse populations. According to the federal government, more than 15 different ethnic and religious groups lived in Whitney Pier in the 20th century, making the whole of Whitney Pier a Canadian heritage site. Whitney Pier was named after the American industrialist who established the Dominion Coal Company and Dominion Iron & Steel Company in 1901, so Whitney Pier didn't even really exist until the 20th century. Sydney River was little more than quaint rural outcrop until the 1960's. During the 60's and 70's commercial development down Kings Road caused people to move into the area and away from the more traditional, centralized neighbourhoods. 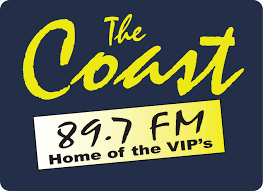 Today, it is home to the best NSLC in the Sydney area. 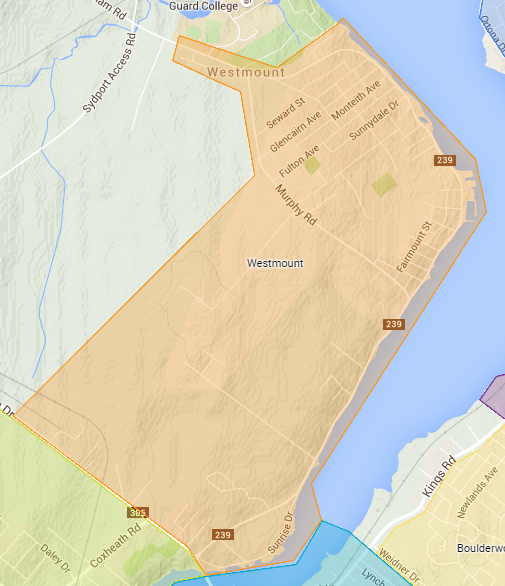 From what I can gather from the internet, Westmount is where really, really rich people used to live. These really, really rich people included the 18th century Mayor of New York City, David Mathews, and industrialist and Senator John Stewart McLennan. More modern notable people include Howie MacDonald and John W. Morgan. All I know is the Dobson Yacht Club is there, and they have an excellent lawn to sip beer by the water. Coxheath was named after Captain William Cox in 1796, where he set up and ran a successful grist mill and dairy farm. That last sentence doesn't sound real, but it totally is. Today it is home to a very pleasant farmer's market. If you believe any of these lines to be inaccurate or that I left anything out, feel free to leave a comment, letting me know that I don't know what I'm talking about, because I probably don't. Mira road was first constructed by the French to deliver supplies between Louisbourg and Spanish Bay (Sydney). At the time, it was one of the widest and most well kept roads on the island, but few, if any people actually lived on it. Settlement of the area didn't begin until after the American Civil War, when New England Loyalists moved to Cape Breton as refugees. It was mostly farmland until the 1970's, when the Mira Road community became a suburb of Sydney. 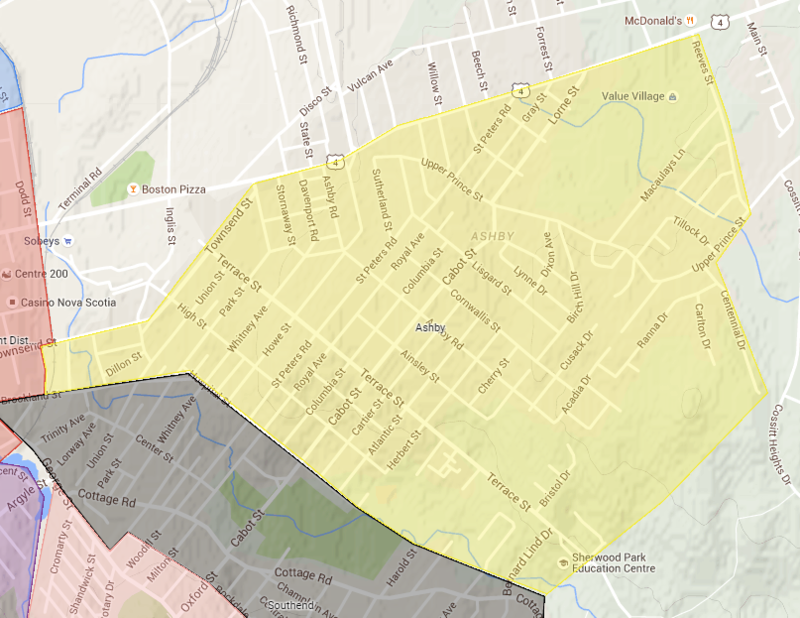 I call the area between Downtown and Ashby "The Badlands". It's where the cruise ship people get to when they hear there's a grocery store. The desolate, post apocalyptic nature of that stretch of town causes all but the bravest of them to turn away. Admittedly, it's improved in recent years. Why aren't there any Goodlands? It seems we're just too pessimistic for Goodlands. That's Open Hearth. They're adjacent for maximum confusion. For some reason Whitney Pier is a Canadian Heritage EVENT, not SITE. I know, it is stupid, but that seems to be what we are stuck with. 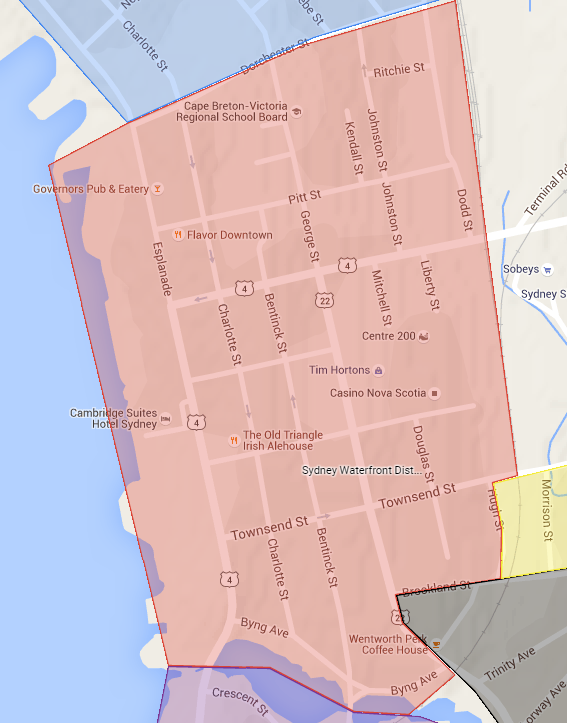 Actually quite a few people live in the Waterfront district. 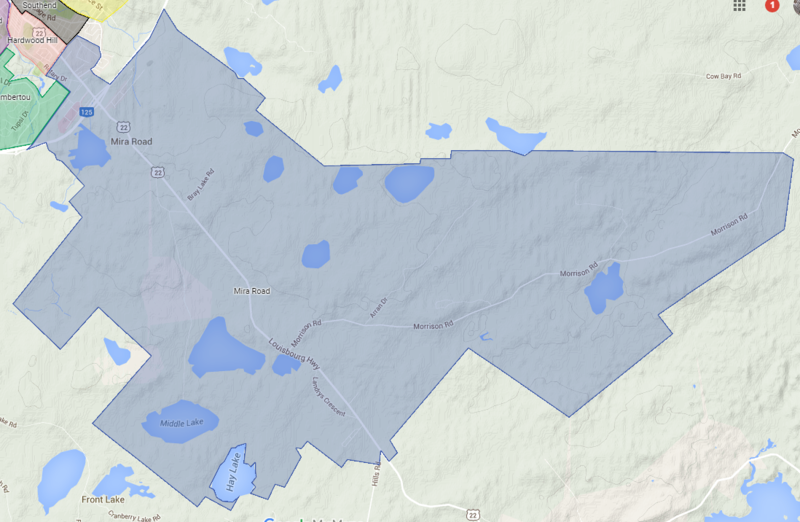 We own a home in this area. South Bentinck and Charlotte, George, Byng and the Esplanade are all residential to the south, not to mention all the apartments in the downtown area. Always wondered by my neighborhood was called the shipyard...now I know. Love the maps, thanks. 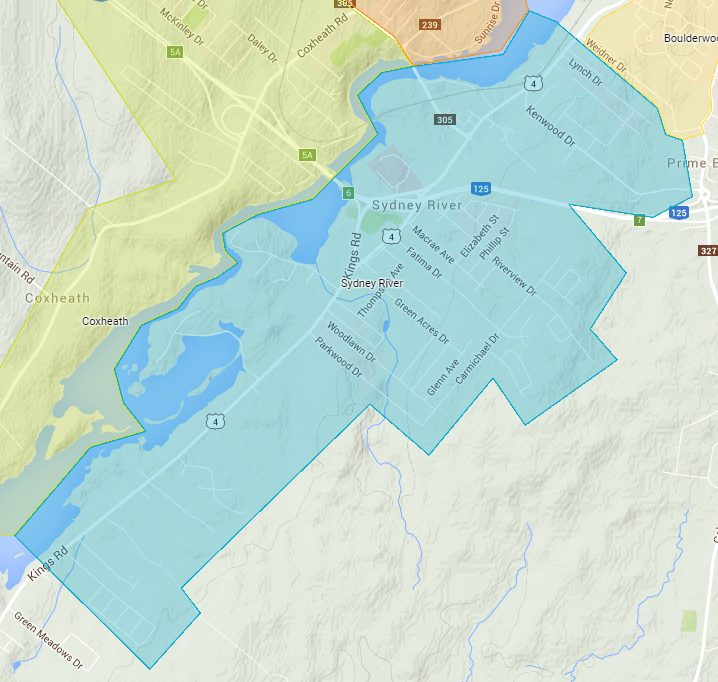 Please create similar maps for Glace Bay & Sydney Mines. And maybe N-Dub. I'm planning to get to that, but it does raise some interesting challenges, such as: I don't live in Glace Bay I don't know anything about Glace Bay I can't remember the last time I was in Glace Bay I know very few people from Glace Bay With this in mind, the Map could take a little bit of time, but I think I can handle it. Perfect time for someone from those communities to step up as your crew of consultants eh? Mira Road is a distinct community with a rich history. 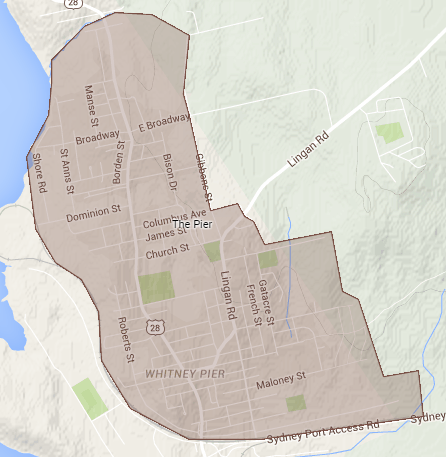 It comes after the Hardwood Hill area of Sydney and before the Louisbourg Highway and the Azar stretch. This is a community that has held several reunions and cheekily divides its members into "up the roaders" & "down the roaders". This area has its own school, churches and fire department.If you look at highway signs you will see the community is clearly marked although the road has long since been divided into George Street and the Louisbourg Highway. 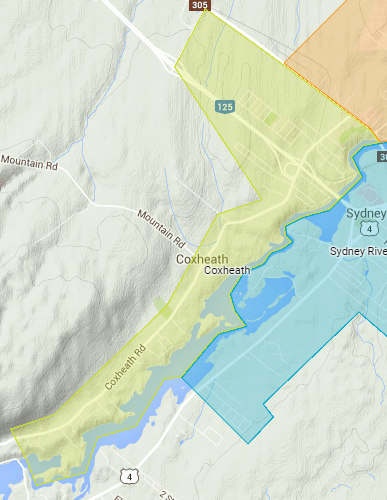 Several of Sydney's founding fathers settled in this area and Pt. Edward as they were rich farm lands. 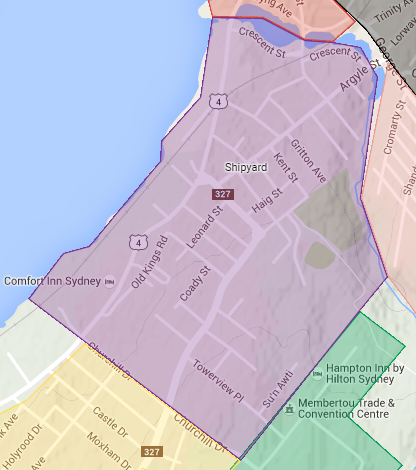 If you would like more information on this section of Sydney it can be provided. Added. I didn't realize the Mira Road had such a cool history behind it.